As worn and dreary as the Frontier was, it'll always hold a special place in my heart. It was the first hotel Frank and I stayed when we first visited Vegas in 1997. It's bittersweet to see the doors close. We went by the Frontier the Friday before it closed to say good-bye. It was pretty busy, the lines for Gilley's were quite long. The crowd around the Sigma Derby was 20 people deep. The high limit room, a few banks of slots, and tables were already shut down. We dropped a couple quarters in slots here and there, it ended up being a profitable endeavor. We hit two small quarter jackpots totalling $70. After our farewell tour we sat on a bench outside the main entrance, and watched folks come and go. Let me tell you, it was an incredibly entertaining way to spend 30 minutes. Here's my Farewell Frontier Album. The first set, taken in daylight, are from the first week of April. The rest are from Friday night. 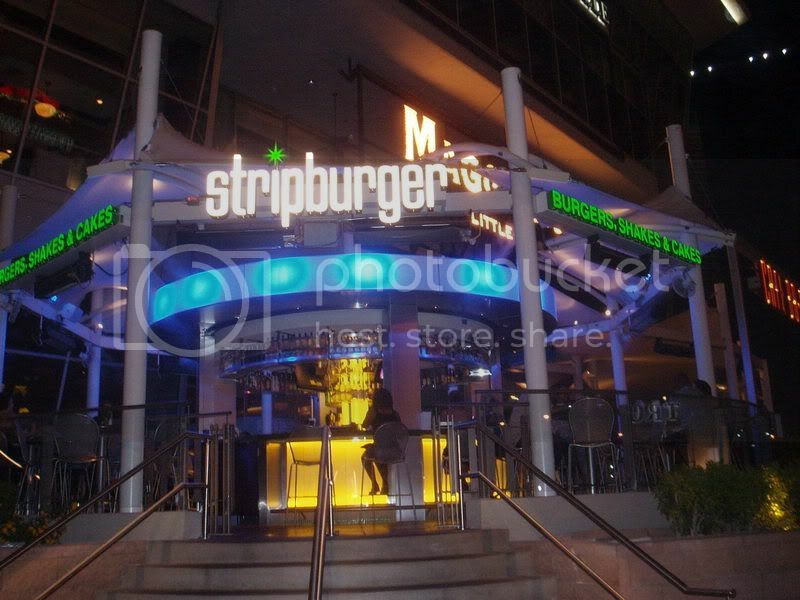 On our way to the Frontier we noticed that there's a new restaurant at Fashion Show Mall, called Stripburger. Menu looks good and prices are pretty reasonable. We'll give it a try sometime soon. Friday the 13th, we dined at Charlie Palmer Steak inside the Four Seasons. We had no trouble making eight o'clock reservations, only two hours beforehand. When we arrived we were offered the choice of dining at traditional table or a couch table. We opted for the latter. Ambiance was relaxed and cozy due in part to the subdued lighting. There were only two other tables of diners when we had arrived. We found it somewhat odd for it to be so quiet on a Friday evening. However, additional patrons arrived toward the end of our meal. Despite the lack of guests, service was remarkably slow to start. A visit from the Sommelier helped to pass the time while we waited on our menus. We chose not to have any wine, but his presence sparked several etiquette questions. A variety of breads were delivered to our table and our drink order was finally taken, but we still had not seen a menu. We grew impatient so I dug into the bread, sure enough that’s when our waiter appeared with menus in hand. We opted to start with citrus prawn cocktail and Caesar bib salad. We selected Filet Mignon and Veal Delmonico as our entrees and chose to share a side of Parmesan potato gratin. We devoured the basket of delicious breads while we waited. The corn bread was particularly notable. Our appetizers were excellent. My filet was prepared with roasted shallot jus. Frank’s Delmonico was served with peppercorn sauce. Both were flavorful and tender. Although, as a matter of personal preference, we rather have sauces served on the side. The potatoes were outstanding; a crisp crust formed across the top and the inside was rich and creamy. Our bill came to $146. I will note that I was a bit surprised to see that my two diet cokes cost $10; seemed excessive to me. In the end, service was sufficient, but I’d expect a higher caliber from Charlie Palmer and the Four Seasons. Nonetheless, it was a fine meal. Nora's is only a few blocks away, despite all the rave reviews, I've had trouble swaying Frank to try it. However, after two great meals in Lake Las Vegas, I earned some credibility and he agreed to go. We had garlic bread and caesar salad to start. Followed up with Veal Parm and Chicken Erbe Fini. Total bill was $40. Food was good and it's a decent value compared to other Italian joints in town. Although, I didn't feel it was special enough to earn a return visit. Life has been full throttle lately and I have lots to share. Frank is finally feeling great, which is a huge relief. He returned to work June 17, it took him a week to get into the swing of things, but he's pleased to be back. Over the past few weeks, Frank's been negotiating with HET for a job transfer to a strip property. As of last Tuesday, the deal is official. Frank will be the Specialty Games Manager, he will oversee Poker, Race and Sports, and Keno. The catch is that he will continue to run Laughlin until a suitable replacement is found and trained. So, he'll likely be managing both properties until October. We intend to sell the Laughlin condo and we anticipate sharing the same address full-time, once again. Hopefully, next year, we will sell our Vegas condo, as well, and move up to a house. We've been busy gallivanting around town, I guess you could say we've made up for our down time in April-June, this month. We've said farewell to the Frontier. We've tried a few restaurants like Charlie Palmer Steak, Nora's Italian Cuisine, Canter's Deli and hit a couple old favorites such as the Buffet at TI and Lawry's. We also stayed at the Platinum Hotel this past weekend and we have the Signature reserved for this upcoming Sunday. Pictures and details to come. We woke Sunday at 8am, showered, and prepared for the day. We decided that we'd have brunch at MiraLago, but it isn't available until 10:30 so we had time to kill. I brewed a pot of coffee and we nestled outside on our patio. Frank check email on the laptop while I read a magazine, such a lovely way to start the day. We weren't sure how far away MiraLago was so we hopped in the car and drove up the mountainside. If it wasn't for the heat it would be an easy walk. MiraLago is the cafe at Reflection Bay Golf Club. They offer Sunday brunch from 10:30-2:30 and it is $34.95. We had the choice of dining indoors or on the terrace; we opted for the latter since the views were spectacular. Then we looked to see what foods were available. Eggs made to order were available from the kitchen. The buffet was divided by salads; cheese and crackers, fruits; breakfast items: eggs benedict, biscuits and gravy, sausage, bacon, potatoes; lunch items: orange pork tenderloin, miralago steak, harvest veggies, turkey pot pie, stuffed shells, salmon, halibut; cold seafood: shrimp, crab claws, oysters, sushi; carving station offered lamb chops and prime rib. There was also a plethora of pastries and desserts to choose from. We sampled a bit of everything. I didn't think to take a picture of our first helping, but I remembered on our second. All in all, it was a really nice spread. We enjoyed it immensely. We felt it was worth every penny and thought it was better than all the top buffets we've had in Vegas. Our server's name was Jeff and he provided us with superb service throughout our meal. He was well-informed and answered all our Lake Las Vegas questions. Needless to say, brunch was excellent! Reluctantly, it was time to go; we had to check out of the room. We packed up our belongings and then head home. We'll certainly return, we found Lake Las Vegas to be a tranquil escape from the craziness of the Las Vegas strip. It seemed liked we were hundreds of miles from home, but in reality it was only 30 miles away. As luck would have it, a stay at the oasis in desert is just what we needed. Refreshed, we headed over to Como's for dinner. Patio seating is available, but not offered tonight due the heat. Therefore, the indoor dining area was quite crowded, but tables were arranged in a way that allowed privacy from other diners. It took only minute to decide on our order. We started with onion soup and caesar salad, I selected filet mignon and Frank chose the rib eye for his entree. He also requested a side of au gratin potatoes. We snacked on a variety of breads while waiting for our meal to arrive. Olive tapinade was served alongside the fresh and delicious breads. We shared our starters; both were nicely prepared, although the romaine hearts were dressed too heavily for tastes. The entrees were delivered in ample time, and each had a lovely presentation. Sautéed spring vegetables and mashed potatoes accompanied my filet. Everything on my plate was excellent and prepared to perfection. The filet had a peppered crust that sealed in the juices and the meat itself was tender. I savored every bite. Frank's rib eye was served with roasted fingerling potatoes and spinach; those were the low-lights of the meal. The rib eye, however, was outstanding. The au gratin potatoes were layered with care and they were delicious, as well. We were quite full when our plates were cleared away, but we found it too hard to resist the dessert menu. We couldn't settle on one selection so we ordered two: chocolate bread pudding and molten cake. Again, the presentation was delightful. My molten cake was beside an expresso cup filled with espresso flavored gelato; garnished with mixed berries. The bread pudding had several layers and was served with chocolate gelato. Unfortunately, the desserts were all show and no substance. They were the weakest links of the meal. Service was great and our bill came to $140. We'll definitely return, but next time we'll forego the dessert. The sun had set when we left Como's. We walked the lakefront and listened to the Jazz band. We planned to walk around the village and check out a few shops, but all the events of the day were taking a toll on Frank (he’s recovering from surgery he had last month). His back was achy and his legs were tight so we felt it was best to return to our room. Before retiring to the room, we snuck a peek at the pool, but it was too crowded to swim. Instead, we called it a night and enjoyed the rest of our evening in our "suite". After we got situated we walked across the Pontevecchio Bridge to the village where the shops, restaurants and casino are located. I snapped a few pictures along the way. We walked through the village shops, but it was hard to see what each was selling because of the scorching sun. Not many people walking about probably had something to do with the 115 degree temperature. We were getting pretty hot from our walk so we sought relief from the hot sun inside Casino Monte Lago. Sweet A/C, can't live in the desert without it. We made a stop at Club Uno for player's cards. We played once there before shortly after it opened, surprisingly Frank was still in their system after four years. I didn't have an account so I was entitled to $5 of free slot play. First stop was $1 Crystal 7's with my free play, nada won there. We moved on to Blazing 7's, no luck there, either. Next we found full pay double bonus VP and made ourselves comfortable. Played for a bit, but no notable jackpots were won. Frank decided to play some blackjack and I hit the penny slots. Finally we each had some luck. We doubled our money and killed a decent amount of time. We met up and played misc slots. Said and done, we lost $20 between the two of us, that's not a win, but we felt pretty lucky. We had time before our dinner reservations at Como's so we decided to return to our room and lounge a bit beforehand. Last Thursday afternoon, Frank suggested we book a hotel for the weekend. Finding a reasonable weekend rate last minute on one of the busiest wedding days of the year in Las Vegas in no easy task. However, I managed to find a room available at Montelago Village on Lake Las Vegas for $160 on Saturday night. After a couple days of anticipation Saturday had arrived. We packed and headed out around 2pm, traffic was a little heavy, and it ended up being about a 30 minute drive via 215. Upon check-in we requested a lakeview room in Luna Di Lusso. No lakeview was available, but we were assigned a studio "suite" in the west portion of Luna Di Lusso. The room was very nice, everything you could possibly need was provided. The view was nothing special since it overlooked the parking lot. But we’ll know next time it'll be worth an extra $20/night for the lakeview upgrade. It's been hectic for the past few months, but thankfully things are beginning to settle down. Frank is still recovering from his surgery last month, but he’s on his way to return to normal every day activities. He’ll meet with his doctor on Thursday; he’s hopeful that he’ll be given permission to return to work. Frank is anxious to get back and his presence is needed in Laughlin. In other news, Frank’s return to Las Vegas is in sight. He has an interview for a Specialty Games Manager position at a strip property on Friday.